As with the rest of the interiors in my Boston Back Bay design project, the husband’s bathroom also needed some major TLC — both architecturally and aesthetically. My clients wanted the space to be contemporary and unique as well as functional and easy to maintain. Bathrooms should be a place of total relaxation and rejuvenation but, like the rest of the home, bathrooms also should reflect discerning tastes and style. I was determined to transform “his” bathroom into a private oasis for the husband to retreat to at the start and end of each day. 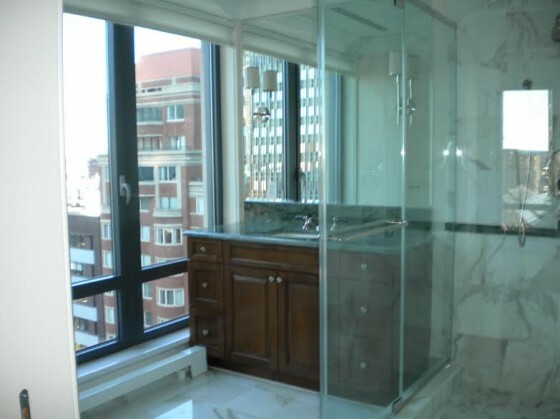 In this before shot, you can see that the focal point was a traditional style vanity topped with green granite with the floor and shower walls in carerra marble. The overall look and feel of this design lacked the spa like ambiance that define most luxury bathrooms. The final transformation of this bathroom oasis is really quite breathtaking — from drab to dreamy, you can see how I achieved the ultimate bathroom design below! 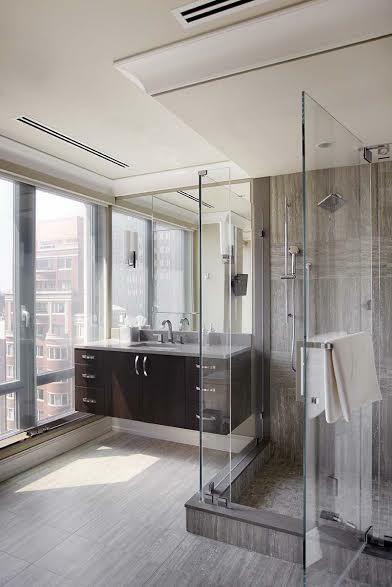 For the vanity, I used dark wood contemporary cabinetry and polished stainless steel hardware that would bring rich contrast and sleek masculinity to the space. I lifted the vanity off the floor to evoke a sense of airiness. The wall above the vanity was clad with mirror to reflect more natural light while also providing functionality. Additionally, I incorporated a recessed medicine cabinet in the center of the mirrored wall for conveniently hidden storage. For the bathroom floors and shower walls, I used a textured porcelain tile. Not only are these tiles attractive and contemporary, they are extremely easy to maintain and don’t require sealing or regular maintenance. The neutral tones create a sophisticated spa-like effect that’s masculine, fresh and appealing. To learn more about the interior design services I offer in the New England area (and beyond) or to discuss a home design project, contact Leslie Fine Interiors, Inc. by calling 617.236.2286.